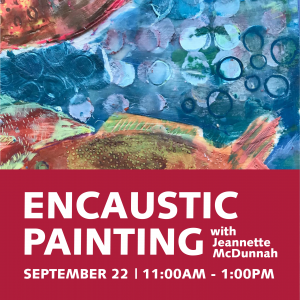 Artist Jeannette McDunnah knows her way around encaustic paints and will guide you through all you need to know to get started with this unique medium. Paint with encaustic wax onto wooden panels, building up texture and color. Learn the tips and tricks you need to succeed. This workshop will feature products by Enkaustikos and Ampersand Art and take place at Hull’s Second Story Gallery + Workshop, upstairs from Hull’s Art Supply + Framing.